2. The report states that the heavily militarised and centralised control of the Tamil-speaking areas with mostly male, Sinhalese security forces creates serious problems for their safety, security and ability to access assistance. Do you have any plans / recommendations to rectify this situation in your capacity as the Presidential Advisor on Reconciliation? I say misleading because the security problems women face are real, but these have very little to do with the security forces. It is both fashionable as well as politically pointed to blame the army, but in fact the real problems lie elsewhere. I am reminded of the attacks made on the security forces with regard to abuse at Manik Farm, whereas the complaints were of abuse by the IDPs themselves – the UN gave us one instance of a soldier going at night into the tent of a female IDP, being joined by another, and leaving several hours later. 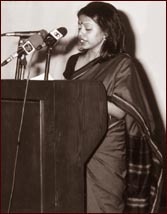 As I told one ambassador who said that she had not heard of any instances of abuse by the military, but their presence made women more vulnerable, such blanket assertions drew attention away from the real problem, which is vulnerability within the community, given the large numbers of single women, and shifting attitudes to sexuality that have been exacerbated by the war situation. We have discussed this issue at length in the initial meetings of the District Reconciliation Committees, though there was more concern about increased consensual sexual activity too and unwanted pregnancies. These could also spring from vulnerability leading to succumbing to pressure not necessarily with full consent, which is also a problem to address. 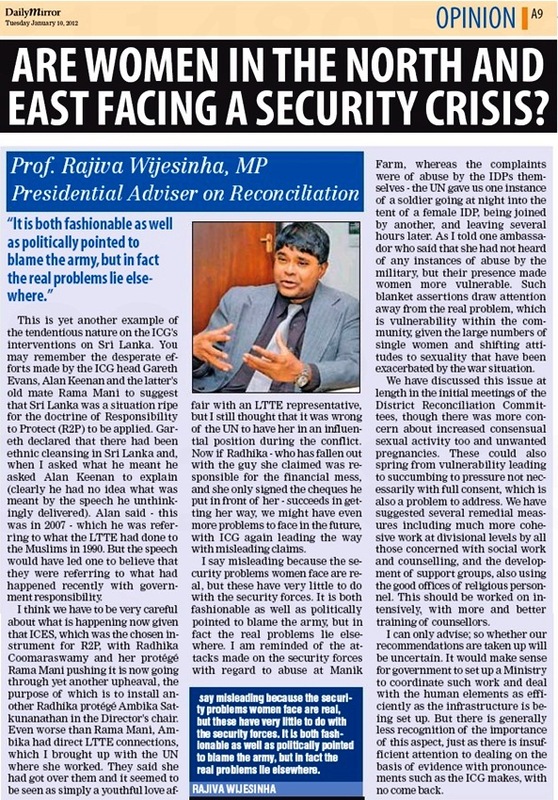 We have suggested several remedial measures including much more cohesive work at Divisional levels by all those concerned with social work and counselling, and the development of support groups, also using the good offices of religious personnel. This should be worked on intensively, with more and better training of counselors. Unfortunately I can only advise, so whether our recommendations are taken up will be uncertain. It would make sense for government to set up a Ministry to coordinate such work, and deal with the human elements as efficiently as the infrastructure is being set up, but there is generally less recognition of the importance of this aspect, just as there is insufficient attention to dealing on the basis of evidence with pronouncements such as the ICG makes, with no come back.